Roasting venison isn’t difficult – as long as you follow a few rules. We’ve talked about roasting venison before – so you know it’s not my FAVORITE cooking method. The main reason why, is that I’ve never been a huge roast fan, whether it’s beef, pork, or venison. 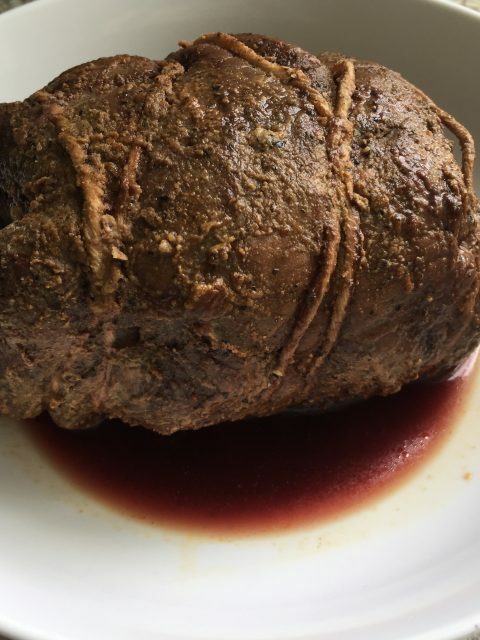 What I’ve come to realize over the years, is that a roast is less about the meat itself, and more about how you dress the finished product: au jus, gravy, horseradish, etc. Having learned that lesson, I find myself roasting my venison more often. 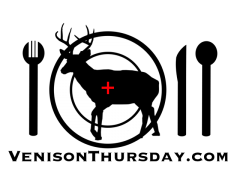 Now, we all know that venison is very lean, and can get super dry and tough when overcooked. That fact alone scares many people away from roasting their venison. It also leads to venison creating very little of its own au jus when roasting – so you should plan on having some other type of condiment to complement your roast. There are three main ways you might roast your venison: in the oven, on the grill, or sous vide. I’ll use the oven if I HAVE to. I’ll use sous vide on roasts that are inconsistent in shape, or I know are from a super tough deer (see the sous vide method here). I’ll rotisserie it on the grill if I want the best flavor. I only use one cut when I rotisserie roast my venison: the sirloin tip. It’s a nice perfect football shape. It’s consistent in size and large enough for nice sandwich slices (or however you want to cut it). The only problem: it’s perfect for making corned venison (see how to corn meat here)! 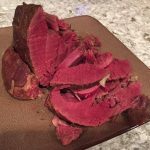 Corned venison is one of my favorite foods – and you only get two sirloin tips per deer – so that’s my little personal dilemma. Find the mid point of the twine. Lay one end of your roast over it. Wrap the twine around, pull tight, and tie a square know. Flip it over, wrap the twine around, and repeat – making sure you have an inch or two of space between each loop. Take the tied roast, and rub the olive oil all over the outside. Next, take each of your spices, and give a GENEROUS coat all the way around. I usually coat one side, flip it, and hit the other side, then rub it into any areas that may have been missed. You don’t need a fancy grill. As long as it has a mounting spot for a rotisserie, you are set. I use a basic CharBroil. As for rotisserie sets, all you need is a basic one (they usually run about $30), but even more complete units are only about $45. So now we are at the hard part: cooking it. We want the grill between 250° and 300º. Being a grill, it WILL vary! I can accomplish this on my 4 burner by putting the two outside burners on high, and leaving the middle two burners off. This has the added benefit of not having direct heat on the roast itself. Once the grill is at temperature, slide roast on the skewer and lock the forks down, and pop it on the rotisserie mount and turn it on. 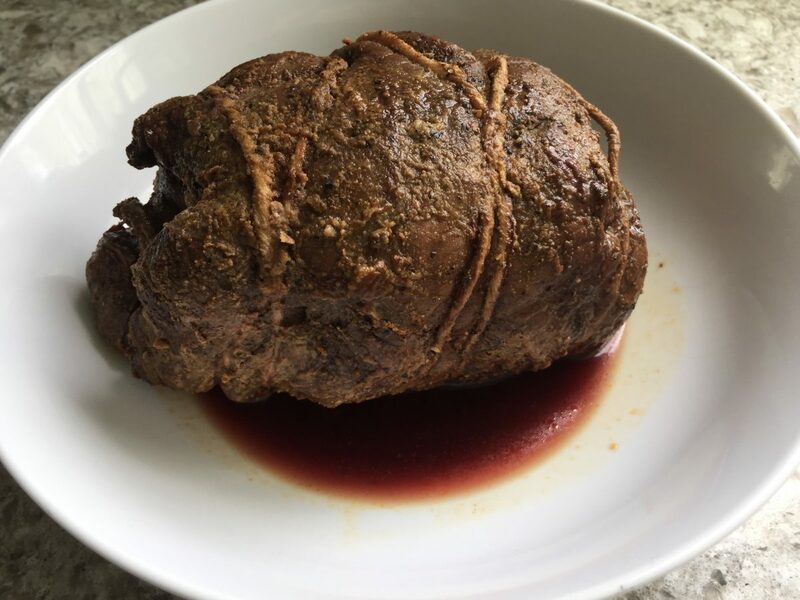 Put a piece of foil under the roast – this helps further dissipate any direct heat Plus it can be used to catch drippings – if you’re cooking something besides venison that actually has some! You HAVE to keep an eye on the grill temperature. If it shies to far in one direction or another, you’ll need to fix it. Try not to open the grill box more than needed. Letting the heat out on a low temp box can really add to your cooking time. At about an hour, check the temperature of the roast, near the center with a meat thermometer. 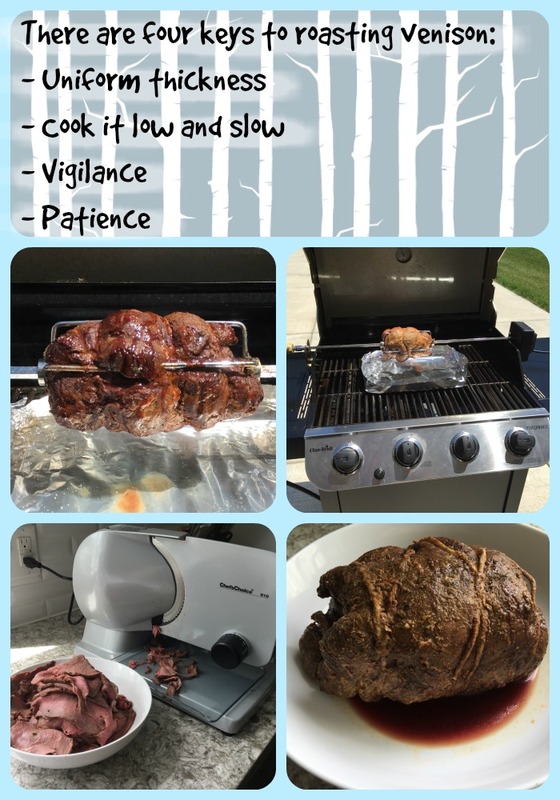 I find it takes between an hour and a half to two and a quarter hours for most of my venison roasts (3-5 lbs). Check the temperature about every 10 minutes after that. Take it out when it hits 135º to 140º, or whatever your doneness preference is. Take it off the skewer and wrap it in foil. If you are eating it right way, let it rest for at least 15 minutes before carving. 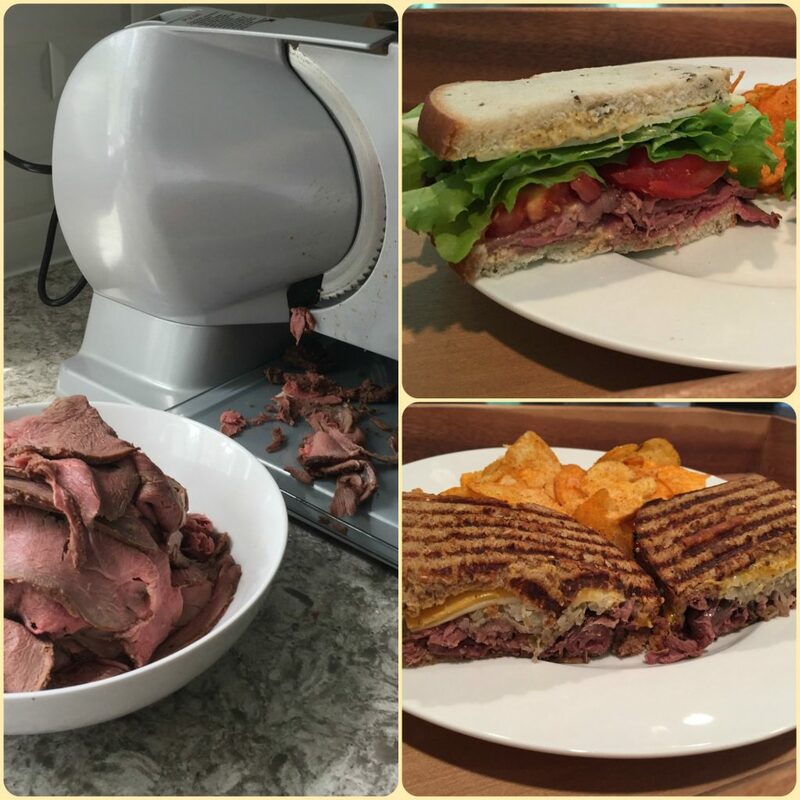 If you are making sandwich slices, wrap it in foil and toss in the fridge overnight. Slice it up the next day… hmmm, just in time for lunch!